Raffie came to me for a Board and Train and is an enthusiastic young Standard Poodle. He presented problems for his owners because of his high energy and difficulty walking him. He was spending a considerable amount of time in his crate because he was just so rambunctious and he grabs things and runs or swallows them. The goal for Raffie was to get him out of the crate and teaching him how to be calm on command and exist with his owners in the home. Walking nicely was the first order of business. Through the use of a prong collar Raffie learned the pressure of the collar meant he was to slow his pace. In no time Raffie was walking nicely on his leash with little effort. His owners also wanted him remote collar trained so a leash did not have to be on him constantly. With low-level e-collar training I could communicate to Raffie the same commands he already understood when using the leash. The end result was a great success and I expect Raffie to continue his growth and development. It is with great pleasure that we write a note recommending New Beginnings Dog Training! 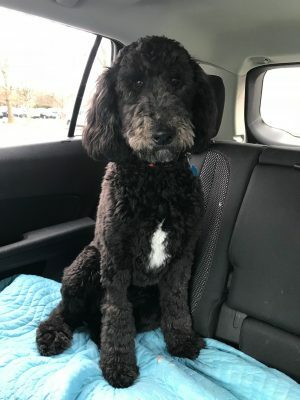 We are absolutely delighted with the experience Raffie, our 7 month old Standard Poodle had with Kristi at her home….she did a wonderful job with him. Don’t hesitate to call her if you want your dog trained properly…….showing caring and kindness while getting wonderful results…..she’s terrific and we highly endorse her work. Raffie had all kinds of experiences while he was living with her to board and train over a two-week time period; she’s the best. We can now eat in peace! Click Shield to See Reviews.